Have you been thinking about buying a home in NYC? Well if you’re single, get ready for a life of mortgage-gouging hardship. 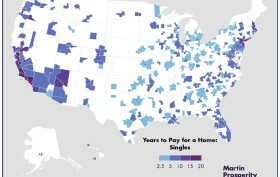 A new study conducted by the Martin Prosperity Institute takes a look at how much Americans spend on housing, where in the United States we’re spending the most, and how many years we’ll need to put in if we want to own a home in a big city.